The sport of lacrosse is growing by leaps and bounds, but the women’s game still doesn’t have the following that men’s lacrosse does. And to get you into the groove, we hope that you enjoy these photos taken by our own Tam Williams during the Champions vs. Champions Tournament in Sparks, MD where Team USA Woman’s took on the 2018 NCAA Women’s Champions the James Madison Dukes. Final Score: USA 14–James Madison 10. Before the University of Denver Men’s Lacrosse team came away with the 2015 NCAA DI Championship Title, the Wingate Trophy, the sport of lacrosse wasn’t big west of the Mississippi. 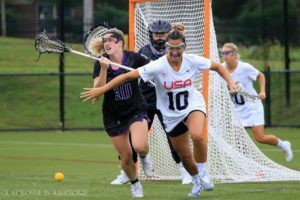 Since that time, lacrosse has swept across the United States with more professional teams in both Major League and National League Lacrosse and more high school students attending colleges on the West Coast for the opportunity to play the fastest game on two feet. However, in all the glory and excitement, women’s lacrosse is rarely seen or even talked about. This is changing, but very slowly. We’ve finally gotten the Women’s Professional Lacrosse League which was formed in 2016 but to this day has only five teams. US Lacrosse formed a women’s team in 1982 and yet they still don’t have the fan base that men’s lacrosse has. Some of you may not know, but the very first modern women’s game was introduced in 1890 at St. Leonard’s School in St. Andrews, Scotland. The rules for women’s lacrosse are very different from men’s lacrosse as well as the equipment. In the U.S., women are only required to wear eyewear or lacrosse goggles and a mouth guard. However, internationally, they are only required to wear a mouth guard, and have the option to play without protective goggles. The stick has restrictions too. It must be a certain length and the pocket must be shallow enough to show the ball above the side when held at eye level. For those of you who have never watched women’s lacrosse, the face-off or draw is one of the most bizarre things you will see. Because they wear virtually no protective gear, they do not have a traditional face-off with the players kneeling at center “X”. The two face-off players stand at midfield while the referee places the ball between the sidewalls heads of the sticks. The players must hold the sticks in place until the whistle is blown, when at that point each player attempts to gain possession. Even the play is different with two meter non-engagement areas on free play; placing their sticks on the field when a possession timeout is called and returning to that same place for the restart of play; among other things that unless you play women’s lacrosse or you have a daughter who does, you most likely do not know or understand their rules. Lacrosse just like any other sport which is dominated by men will take years to grab hold of the general public. But regardless of what some may think, women’s lacrosse is a physical and complicated sport and it requires an insurmountable amount of hand and eye coordination. If anyone thinks that lacrosse is easy, I dare you to pick up a stick and see how much talent it requires to keep the ball in the correct position in the mesh in order to make a decent pass. This doesn’t even take into consideration trying to catch the ball. Now put the two together while running down the field and you will find that even though you may be able to do one or the other with ease, it requires true talent to do them both. 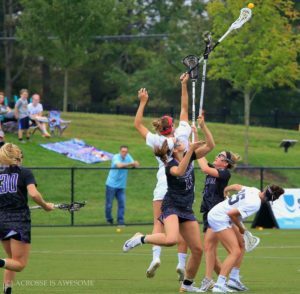 This being said, women’s lacrosse can be just as exciting as men’s lacrosse and if you get the chance, head out to a college game or even head over to a local high school where girls lacrosse is on their athletics list and you will be hooked.